History- Britney grew up mostly with her father, her mother having died when she was two and her brother having moved to Windia when she was six. Just recently her father sent her to Windia to live with her brother Ray and his guardian Kristeen Diagon. Britney has started attending school at the Windian Elementary and is currently in the second grade. Special Ability- Is around the age where she should be obtaining her first whelp transformations. Favorite Possession- A music box that used to belong to her mother. Favorite Thing to do in Spare Time- Go for walks in the park with her brother. 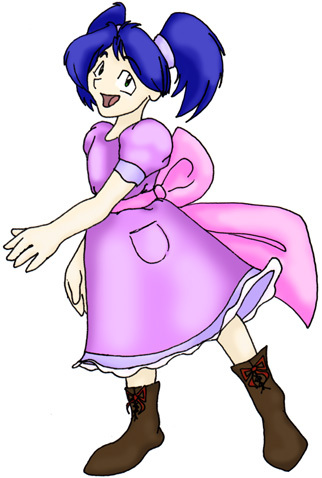 Personality Quirk- Britney's a very innocent and niave little girl... which makes her really cute. =^-^= But at the same time it makes it easy to take advantage of her innocence, so Ray often has to pay close attention to make sure she doesn't get into trouble. Intersting Fact- Britney's about reached the age where she should be acquiring her first dragon transformation ~whelp~, the only problem is no one can say when it'll happen. Since Ray had been trained for his transformations it wasn't a problem to tell when he'd start transforming, but Britney's a bit more of a mystery and everyone's just waiting to see what will happen and when.